Can Amazon’s CPM Ad Program Rival AdSense? Let me start off by saying I’m not a fan of launching content on Sundays, BUT the 15th of the month (A.K.A. my podcast day) just happened to fall on this day. About six months ago, Amazon released a CPM ad program through their affiliate (associates) program. CPM stands for “cost per impression” so that means you earn for ad impressions, not clicks. You can also set your ad prices to gain more control over your profits. To join, you must be an Amazon.com affiliate. And it appears they released the program to their top earning affiliates first, and then began rolling it out to others. So if you don’t see the tab in your account yet, it’s on the way. I tried the program twice — first, when it rolled out and again last month. My earnings didn’t hold a candle to AdSense. However, I’ve read in forums that some people are earning more with the Amazon CPM program than AdSense. So it’s definitely worth testing it out, especially if you have a decent amount of traffic. I’d love to know if you’ve tried it or plan to give it a whirl. Could you let me know How much amazon pays for 1000 impressions? and also what is their average CPC rate. You set your own price with Amazon CPA. 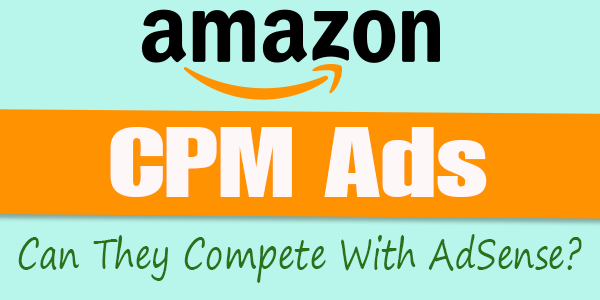 Can you share the numbers between the amazon CPM Vs Adsense? The number talks a lot and I know it depends on the type of sites too. I’m heading towards Amazone affiliate program, As you said its CPM Ads are giving more than Adsense then its better to try this once. can we use both the adsense and amozon ad unit on the same page? If it happens will it reduce the RPM for the adsense clicks? Yes and you’ll have to experiment to see if it reduces. Everyone’s site will be different. This program may work well for those who get tons of traffic to their site. I only get about 600 views a day, so the regular Adsense program works great of me. It would take a month for me to earn what I earn in a day with Amazon. I like your website very much this is my first comment ever online, You are straight with your content appreciated very nice Information. was helpful, I downloaded one template for my website thanks a lot and keep it up great work. I would like to try Amazon CPM.. So it seems like unless you try this out for an entire month you can’t get an accurate result on what the Amazon CPM ads could earn for you. Am I right? Or do you have a different understanding? I’m just trying it out right now and was wondering how long should I run the test. I don’t see the tab in my account yet, with my site receiving 30k visits per month CPM is not a good choice. In general, and for most people, yes. But you can always try to test. I just stopped using GoogleAdsense and didn’t even know Amazon had a CPM Ad program. I saw results with GA but feel it isn’t the right thing for my blog right now. I’m not sure I will try AMZ but given your results with your blog and traffic it may not be something worth trying. Nice one lissa,dont you think amazon might disturb my adsense earning? It might. That’s why you have to test. I think its early to compare with Google adsense may be after sometimes people may take some interest. what… I had no idea. I’ll check this out as soon as I get home to my laptop. Never really had any success with Amazon affiliate program. Maybe this will be different. I guess I wasn’t paying attention as I actually did have that option added to my account. Giving it a try right now, although I doubt that it will equal adsense. That is still performing very well for me. I’m just going to put it in as an extra ad. Do you have any recommendation as to what cpm rate to set? I mentioned that in the podcast. Use the same RPM rate for another AdSense unit on that page. Start there. If your fill rate is good (at least 50%) then stick with it. If you get no ads, try lowering it a bit. Good luck! Thanks for the information! I will certainly explore this program to see what it has to really offer. Hopefully it will make a difference in comparison to Adsense. I wouldn’t mind trying it. I know Yahoo or media.net actually out performs Adsense on my site. Have you tried it? I haven’t tried Media.net or Yahoo. i tried medianet before they pay by impression not clicks and can only receive payment by paypal or domiciary account which i dont have because i am from Nigeria. Buy from seller . sell to buyer http://trade.adahor.com/ #1 Nigeria classified website. You need tons of traffic to make money with any CPM program, and I just don’t have that kind of traffic to any of my sites. My regular Amazon links convert way better than my AdSense, even with the limited traffic I get, so I have no plans to switch to the new program. I never even heard of the new program until now though. Thanks for the heads up. Yeah I do much better with the Amazon affiliate program too. I totally agree. I think the simple text links make more money than adsense. The taste is in the pudding. It’ll be interesting to test this before making conclusions, especially for someone not doing well with AdSense. But then, I need to listen to the podcast first. It’s you, so it’ll definitely be topnotch. This is a new one for me. I’ve not seen the Amazon CPM tab on my account yet so that must mean I’m not one of the chosen few to receive it. Yeah right!!! My only thought about the Amazon CPM is similar to what I have about Google Adsense. Don’t rely on either one of these as a primary source of income; particularly Google. If you live by Google, you’re gonna eventually die by Google. Google can’t be trusted. My guess is the same thing can happen with Amazon CPM. It’s only a guess since I don’t really know Amazon CPM. So, make extra effort to monetize your site using other things such as affiliate marketing, selling ad space, donations to your site, accept sponsored posts & articles, generate “Leads” for other companies, build an “Email List”, set up an online store, sell your site to someone else, sell text-link ads, set up “infolinks”, set up RSS feed ads, and start a private forum or coaching class(es) to mention just a few. These methods will certainly keep you busy making your site more productive instead of sitting back and idly waiting for money to start rolling in from Google and Amazon; something that may never happen or the money will be slow in coming in. You have better thing so do. Does this sound logical? Yes / No / Maybe???????? Completely agree. In other words, it’s about diversification without relying on ANY one source. My amazon account didn’t have CPM tab, too, but my friend have. I think amazon just try this program and invite account who have performance traffic and content. When my book goes for sale, I certainly hope I make more money on Amazon then Google Adsense. Good luck with your book, David! Personally for me both these never worked, neither adsense nor amazon associates. Well the good news is you don’t have to ditch AdSense. You can actually use both in the same unit. But I found it to be no contest. Really? It complied with adsense policy to place amazon ads and adsense in same webpage Lisa? I saw nothing in the terms that say you cannot. I have tried many different ad programs with AdSense such as Chitika, Kontera, etc. over the years.